The park said it will stay open despite damage sustained during the shutdown. 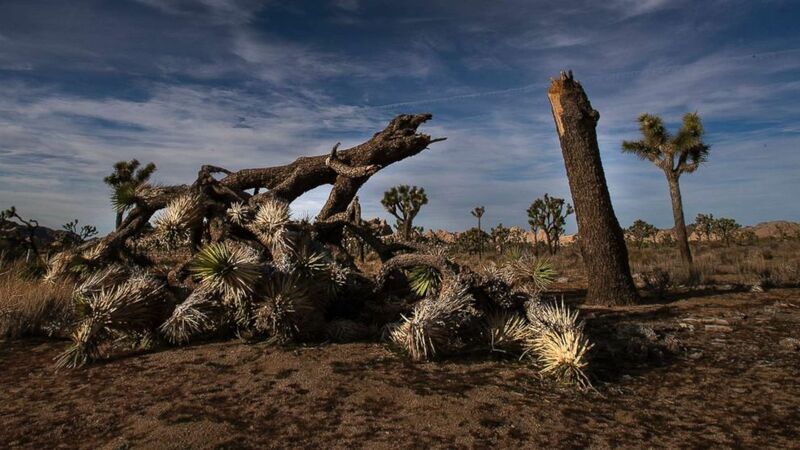 Officials at Joshua Tree National Park say some of the iconic trees and landscape have been damaged by visitors and motorists during the government shutdown. Earlier in the week the park said it would have to close to address "sanitation, safety, and resource issues" but said Thursday that they were able to avoid closing and restore access to campgrounds and other areas that were previously closed. 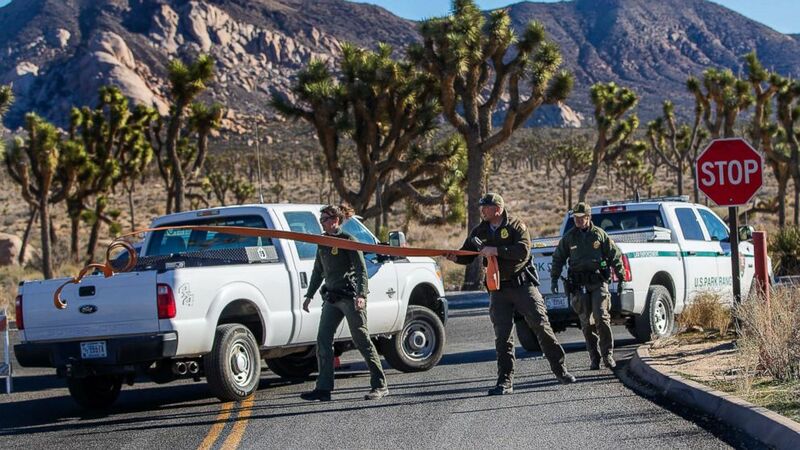 Because of the National Park Service's decision to tap into previously collected fees to restore services like trash pickup and maintenance, Joshua Tree National Park stayed open and even re-opened some more areas Thursday. National Parks Traveler, an independent news site about national parks, reported that Joshua trees were cut down to make new roads and there were a dozen instances of high vehicle traffic off roads. 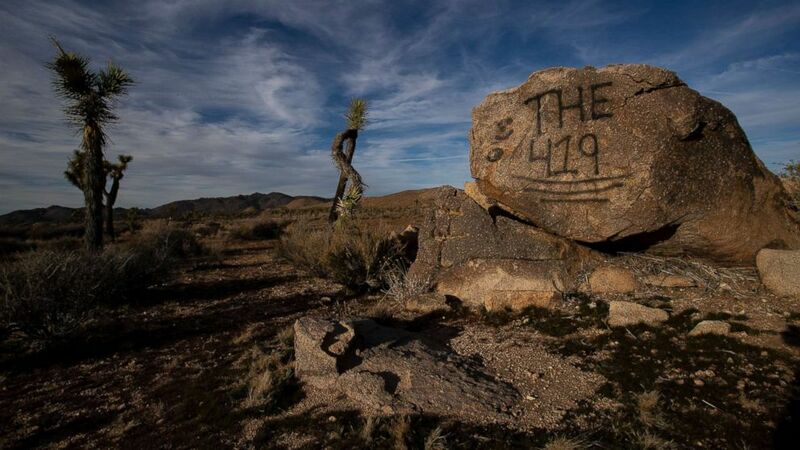 (Gina Ferazzi/Los Angeles Times via Polaris) A once vibrant Joshua Tree has been severed in half in an act of vandalism in Joshua Tree National Park on Jan. 8, 2019 in Joshua Tree, Calif.
(Gina Ferazzi/Los Angeles Times via Polaris) A rock has been vandalized with graffiti in Joshua Tree National Park on Jan. 8, 2019 in Joshua Tree, Calif.
"While the vast majority of those who visit Joshua Tree National Park do so in a responsible manner, there have been incidents of new roads being created by motorists and the destruction of Joshua trees in recent days that have precipitated the closure. Law enforcement rangers will continue to patrol the park and enforce the closure until park staff complete the necessary cleanup and park protection measures," park officials said in the release. The National Park Service recently announced that parks could bring back some staff and provide more services,such as trash pickup, using money collected from fees in many parks. Acting Interior Secretary David Bernhardt wrote in a memo the park service could use all the funds collected from fees to maintain services during the shutdown, which could leave even less money for maintenance projects in the parks going forward. 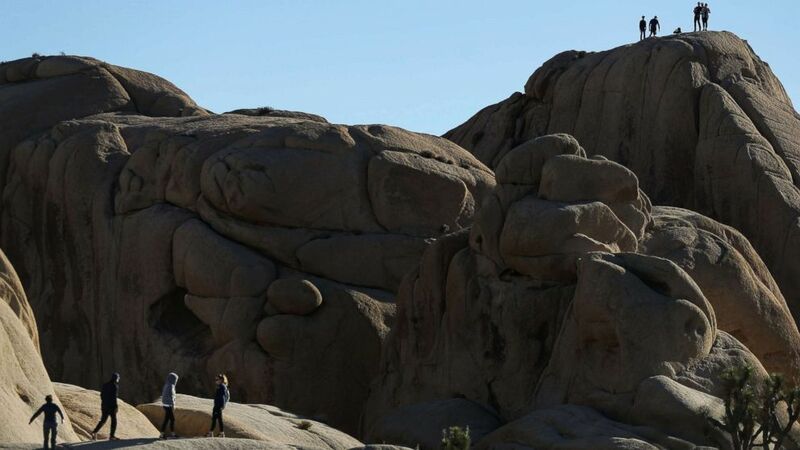 (Gina Ferazzi/Los Angeles Times via Polaris) Rock climbers enjoy the scenery at Joshua Tree National Park on Jan. 8, 2019 in Joshua Tree, Calif.
(Gina Ferazzi/Los AngelesTimes via Polaris) Park rangers close off the access road to a campground at Joshua Tree National Park on Jan. 2, 2019, in Joshua Tree, Calif. Open-air national parks stayed open during the shutdown but with more limited staff than usual. Park rangers still enforced rules within the parks but ABC News reporters witnessed people allowing their dogs off leash and walking in protected areas last week. Some campgrounds in Joshua Tree and other parks closed last week citing health concerns after toilets could not be serviced. 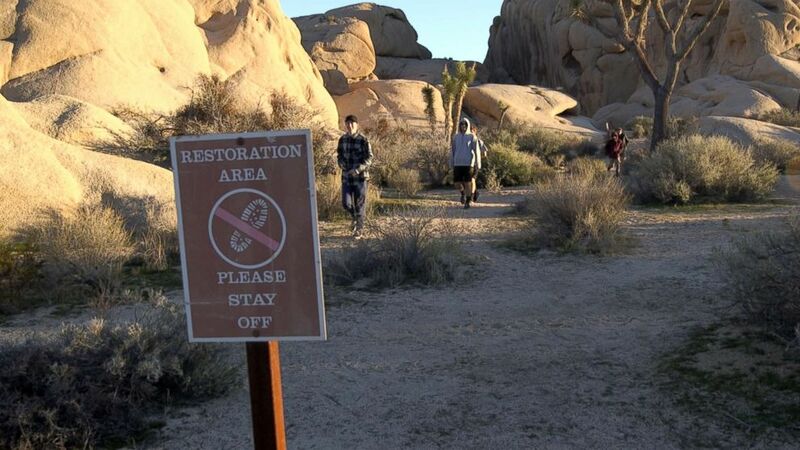 (ABC News) Visitors walk through a sensitive "restoration area" at Joshua Tree National Park in January 2019, during a partial government shutdown. 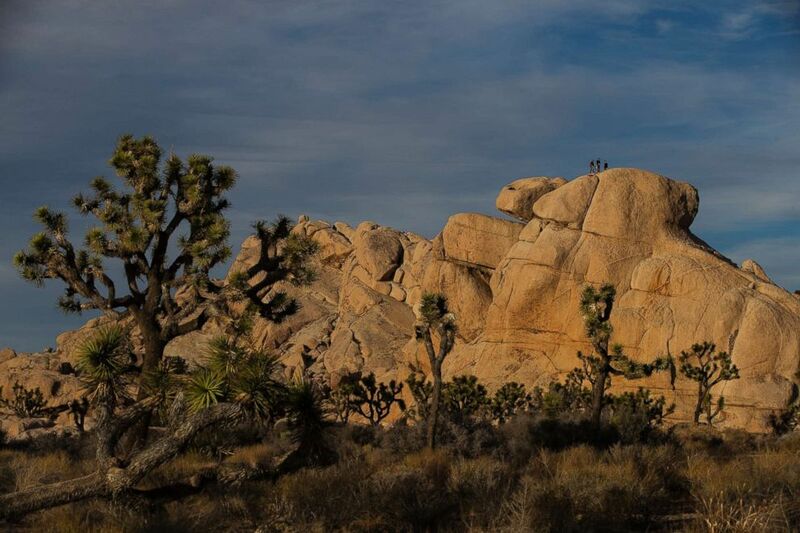 (Mario Tama/Getty Images) Visitors walk atop rock formations at Joshua Tree National Park on Jan. 4, 2019, in Joshua Tree National Park, Calif. Visitors to multiple parks reported that trash was piling up and restrooms were not being serviced, despite volunteers efforts to keep the area clean.